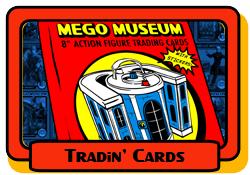 Forum: Mego Museum Trading Cards! Sticky: List of cards made as well a pics of them? 2019 Mego Meet Cards ? Looking for some museum cards. Popy Set Fnished AT LAST! All I Need is the SCARECROW! Looking to update my Set.